The Pitmen have completed preparations for the major match of the Ukrainian Premier League round 21 versus Luhansk-based Zorya. This morning the team had a one-hour session, having concentrated on set pieces and tactics improving exercises. 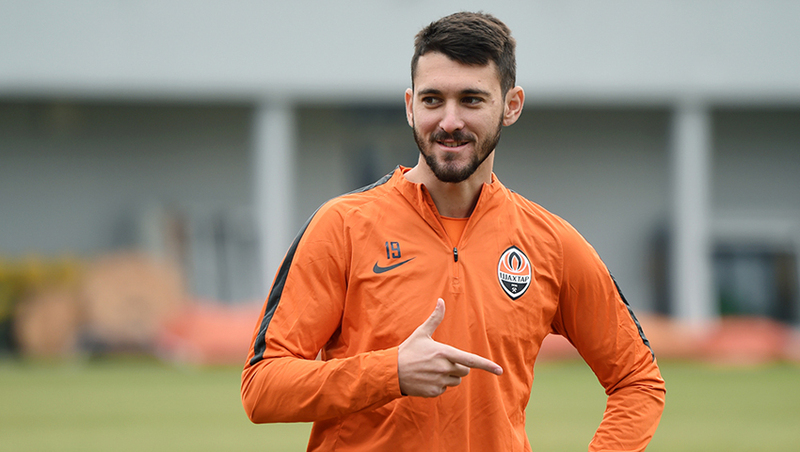 - For now, we play one match a week, so we have time to recover and load ourselves properly, - tells Shakhtar defender Ivan Ordets. We have been training hard all these days: nearly every session was followed by additional load at the fitness facility, as well as a lot of running and working on tactical issues. I think the team is 100 percent ready for tomorrow's encounter. We know that Zorya display brisk football using flanks, with the players succeeding in launching counterattacks, as the Luhansk side scored many goals using such tactics last year. When losing the ball, we must immediately set to regain the possession giving the opponents no opportunities to counterattack. - Have Zorya seen any changes in their performance following the winter break? - I think, nothing has changed much. Everyone knows their strengths, which are counterattacks and set pieces near the opponents’ goal. There are plenty of physically strong and tall football players at Zorya, who can decide a match. The same Bonaventure is fast and highly skilled. We need to operate cleverly defensively. If we keep our eyes open, spot for each other, beat to it, Shakhtar will have no problems. - We waste many clear-cut opportunities and often get nervous towards the end of the game. But, the crucial thing is that we create those goal-scoring chances. Of course, we should strive to convert them to the fullest. - The second stage of the domestic league kicks off in two rounds. Will Shakhtar have enough motivation for all matches remaining, given a huge gap between the competitors? - We need to win every game. Shakhtar is a team used to win only. Each player must be motivated. The more so that we have not claimed the title for a long time. This season, we need to win gold in the Premier League and raise the Ukrainian Cup. After having lunch and rest, the Pitmen will leave for the airport. The flight to Kharkiv is scheduled for 20:30. Let us recall that the Ukrainian Premier League round 21 meeting Zorya vs Shakhtar will be held on March 12 in Kharkiv at the OSC Metalist. It gets under way at 19:30. You can purchase tickets at the Metalist stadium ticket office, online on shakhtar.com, on the club’s partner sites tickethunt.net, internet-bilet.ua and e-sport.in.ua, as well as in retail outlets in Kharkiv.